In these days where skills not readily measured by standardized tests are under-taught, teaching critical thinking skills has become something of a subversive act. Still, dedicated teachers know the importance of developing such skills among their charges. One of the most engaging means of taking history students to the levels of evaluation and synthesis is by exposing them to the dissenting views present in any historical event. Discovering how to identify perspective and bias among the evidence contained in written accounts is an experience that shouldn’t be put off until the junior or senior year of high school. In fact, the appropriateness of teaching this level of learning is often grossly underestimated for elementary students. The month of November offers an especially good opportunity to begin preparing students to become independent learners. 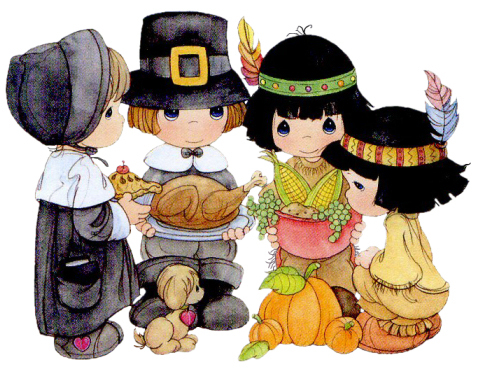 Each year, in countless elementary schools, halls are adorned with the cartoonish sight of Pilgrims and Native Americans sitting down to sup on what looks to be a Butterball. Squanto, the English-speaking Wampanoag,* is prominently displayed with no thought given to how a Native American happened to know the English language. Bearing what is truly the simple faith of a child, a youngster in fourth grade accepts these scenes and the accompanying craft activities as fact, setting the conditions for what can be some meaningful learning. With many states selecting the year for teaching state history as fourth grade, units on the study of Native Americans often happen in November, culminating with some pre-Thanksgiving event held a day or so before a four or five day holiday break. This was the case when I taught a group of academically gifted fourth-graders in a rural school in Ohio. Coordinating with the regular classroom teachers at that grade level, I arranged to have this group of students come to my room for an advanced Native American study unit while the rest of the students remained for a more traditional unit of instruction. And that’s how the change began. For my unit, I first organized my small class into five reading groups. Each group had a different, ostensibly similar written account of the first Thanksgiving. One of the texts was the approved textbook account, the others included differing accounts, some less subtle than others, including one contradictory, though accurate version. The students were assigned to each individually read their group’s material and then collaborate on writing a common summary of the key events. This activity took several days of work with the summaries shared only among the group members who prepared the findings. The Jigsaw Method remains both as popular and as effective now in the digital age as it was whenever the technique was first formalized. Using this method, I formed five new groups with a mix of members from each of the initial reading groups. The task for these new groups was to quickly share the summaries brought with them and then agree on a collective summary of what happened at the 1621 feast at Plymouth. What the students don’t know at this point is that each of the five accounts differs in perspective, detail and in many cases, fact. By adding a bit of urgency for the accomplishment of the summary task, that beautiful state of cognitive dissonance – so crucial for learning to occur – materializes in animated wonder. At this point, your role as teacher becomes one of safety officer as debates often turn heated among students who’ve had little exposure to questioning the material they’ve been given to accept on faith. The balance of instruction time in this unit, in this case about four more class periods out of a total of ten, is spent teaching students to think. The debates have cooled to the point where only good questions by the students remain. By insisting that students identify evidence and then weigh that evidence, often times against contradictory evidence, the concept of bias becomes real. By including material from diverse perspectives, such as a letter by present day Paugeesukqs to then Connecticut Senator Christopher Dodd**, presenting a dissenting view of the First Thanksgiving, the understanding of bias leads to the realization that a historical event has many interpretations without any of them necessarily being false or inaccurate. A warning needs to be sounded before teaching young people to think critically and independently. You’re likely to receive disapproving comments from other teachers. Your students will, forever more, speak out when they discover bias, recognize contradictory evidence and irrational conclusions in just about every textbook to which they’re assigned. When these conversations of concern begin to happen, you’ll know that you’ve produced meaningful results. Author’s note: I’d appreciate hearing about other methods used to teach critical thinking skills, especially in the lower grades. If you found this post interesting or helpful. please share! I live in a state (NH), where the legislature passed a law where a parent can request an alternative if they object to any part of the curriculum. On top of that, just before the legislature ended their session at the end of last month, they also, in essence, lessened the ties between home schooling and practically any formal oversight from the state! Here in Indiana as well as in neighboring Ohio, the home school lobby – and I’ll let you guess which party they have in their pocket – is essentially unaccountable academically. When a parent is about to be charged with educational neglect as a result of truancy violations, their remedy of choice is to wander into the administration office, withdraw their offspring and list “home school” as the reason. I’m not joking. I find your approach interesting, especially your comment about the disapproval by some teachers. What I find interesting is the notion that we shouldn’t introduce “controversial materials” into our classrooms. These are kids who are coming into a world of controversy; where other than the classroom under the guidance of a trained teacher to learn to cope? I have a file called “My life as a subversive” in which my favorite clippings are some from New Jersey and Texas. Some parent groups were upset that in one of my books I had a quotation by W.E.B.DuBois–a communist. The Dallas Daily News reported conniptions among some parent groups. This is, until the John Birch Society discovered that I had also included quotations by Harry Elmer Barnes, a right-wing revisionist. The society lauded the book for including such comments which rarely see the light of day.I guess the answer is to be an equal-opportunity offender. Seriously, I think the earlier we introduce a rational approach to controversy the better–subject only to the level of comprehension of the students. Thank you for the comment, Bernard. One of the biggest obstacles to improving public education, a state constitutional duty in many states including Indiana and Ohio, where I taught, is the local control by school boards. Ostensibly, these elected bodies were intended to provide oversight, in part, of the local property taxes. In Indiana, the school boards replaced the running of schools by the local township trustee and the county superintendent when most township schools were consolidated in the late 1950s and early 60s. Since that time, two developments have occurred. The first is that popularly-elected board members tend to be as qualified to make school policy as would a similar group executing carrier landings of a jet fighter. The second event in Indiana was the near complete removal of local property taxes – the most stable of all revenue streams – from school funding. The consequences of the remaining system of local control are not good. Despite the fact that teachers are licensed by state authority and tested by subject through national means, school curriculum remains the product of lowest common denominator as established by local custom. To teach the much needed higher-order skills that are the greatest gifts of the humanities, a capable teacher currently has to run the risk of being reported to one crusading Tea Party member or religious fundamentalist who happened to with the popularity contest. Eliminating this structure would go a long way towards providing a world-class population. Thank you for the comment, Paul, as well as the correcting my placing Connecticut’s former senator in the late Ted Kennedy’s state. Great stuff. I think that Nathaniel Philbrick’s “Mayflower” should be required reading for High School American History Intro. courses (Typo on Dodd–Senator from Ct., not Mass).